Welcome to Garden Bloggers' Bloom Day for July 2017. Here in my USDA Hardiness Zone 6a garden in central Indiana there are blooms a-plenty in my summer garden. And they do not lack for moisture. We usually get an average of 42 inches or so of rain in a year and so far this year we've already gotten over 35 inches. We are blessed, except in areas that flood. They are flooding. 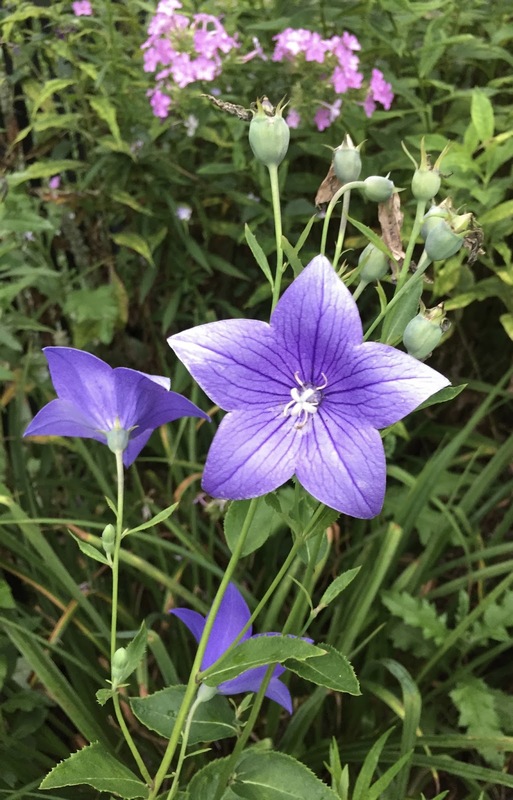 Out in the garden, the balloon flowers, Platycodon grandiflorus, are swelling up and popping open, as they do. If I would have stepped back a bit when I took this picture of them, you would see that my balloon flowers are not well placed in Plopper's Field where I plop perennials in open spots where I think they won't get covered up by flowers around them. Oops, these ballon flowers are somewhat hidden by some nearby Amsonia, blue dogbane. I keep threatening that I'm going to dig up Plopper's Field and replant it all properly some day. But "some day", as we gardeners know, is a code phrase which means "I'm probably not going to find time to do it, but I like to think I will." The other story this picture tells is in the lower left hand corner where you can see a slighly out of focus thistle plant. Oh, Thistle, why doth thou torment me and my garden? What have I done to deserve your unwelcome visits? Moving along, the rest of the garden is more or less blooming on schedule. I shall now proceed with a litany of pictures so you can see some of the blooms. If you are in a hurry, scroll down to the bottom to find the usual bloom day instructions. But why hurry? It's summertime. Come along for an evening stroll through my garden, and imagine me taking picture while off in the distance there is thunder and yet more rain coming to my garden. We will criss-cross all over the garden because I just let the pictures load in a random order. Culver's Root, Veronicastrum virginicum is blooming nicely in the August Dreams border. Behind it those yellow flowers are the tall daylily 'Notify Ground Crew'. Really, that's the name. We could be dropped into the garden blindfolded and then as soon as we saw the coneflowers, Echinacea purpurea, we would know it was high summer. Phlox is blooming! This is Phlox paniculata 'David'. Just one bloom has opened on this lily, 'Black Beauty', but when that whole candelabra of buds opens up it is going to be stunning. False sunflowers with more phlox. I don't know the variety of Phlox. I've had them forever. The false sunflower is Heliopsis helianthoides, and most are seedlings of named varieties, particularly 'Loraine Sunshine', that I bought decades ago. I've been gardening a long time. Another candelabra of buds. Can't wait to see the flowers. Of course I have daylilies. Of course I've lost the labels so I don't remember their names. There are three varieties in this picture. And a rogue perennial sweet pea vine, Lathyrus latifolius, in the lower left hand corner. I pull it when I see it. It mocks me. My bottle tree is finally in bloom. Don't judge me by the years it took to get bottles for this tree. Yes, I know green and clear bottles don't really stand out but I like green. And they were free. Finally, I figured out how to get Sweet Alyssum to spread out and really bloom and perfume a garden in mid-summer. Plant it in March. Yes, March. It doesn't mind the frost and it has a chance to get established before the heat of summer. Zinnia time is summertime. Or is it summertime is Zinnia time? Did I mention Zinnia time is summertime? Once more, in case you don't believe me. Zinnia time is summertime. And zinnias are oh so easy to grow from direct sown seed in the garden. If you don't have a few zinnias in your summer garden, what's wrong with you? A bit of yarrow in a neglected corner. More daylilies. This one I know the name of. It's 'Hyperion', an old variety that I like a lot. More false sunflowers. Those plants are over six feet tall. Do remind me to deadhead them as they are prolific self sowers. The cupflowers, Silphium perfoliatum, are blooming. I definitely deadhead these because it is a big plant and I don't need big plants like this one taking over the perennial border. How about hydrangea? Now that's a summertime flower. Hydrangea paniculata 'Limelight'. And so are some black-eyed Susans, Rudbeckia hirta, probably. And some Agastache, with more 'Hyperion' daylilies. This is Agastache 'Blue Fortune' and the bees love it. Carol-your garden is looking marvelous for July! I adore the photo of the Agastache and Daylilies, which is such a wonderful combination. Your Zinnias are beautiful s well, and a true sign of summer. I have many of the same blooms in my garden such as Echinacea, Rudbeckia, Hydrangea and Astilbe, which all sing summer's arrival. Come by and take a stroll. As always, thanks for hosting Bloom Day and Happy Gardening! So, I'm hearing you say that summertime is zinnia time? Such beautiful and colorful flowers. Hyperion is my favorite daylily too. Such a big bloom, and such a nice fragrance! There are some in my garden but they had just finished with their day when I went out with the camera. Your garden is looking great, especially with the bottle tree finally in bloom. The garden fairies have sure been busy! I always enjoy seeing what is blooming south of me. Visions of what is to come. Now I am kicking myself for not getting zinnias planted. I love zinnias! Next year I will not fail. I am quite envious of all of your blooms! It has been close to 100 degrees here in Southern Virginia for the last week and we have another week of it coming. This only happens every few years here where temps will spike this high for a long period. I am in plant saving mode and the only thing blooming are the cannas which don't mind the super high heat. I wish you could send some that rain our way Carol, we're having a relatively hot and dry one here this year. Having said that we did have an inch of rain during the week and the garden's looking much better for it. Oh, Carol, I love zinnias but, for some unknown reason, they don't grow well at my house. I have to grow them at a community garden and we weren't able to get in to plant until late May due to a water issue. But yours were the next best thing. I love all your flowers. What can I say, besides Happy GBBD? At last I have some of the same blooms in my garden as yours. Your blooms are terrific! Happy GBBD ! I love the flowers in your garden this month, including the Veronicastrum. I was introduced to it on this year's Fling, and I'm smitten! It's one that benefits from some space to grow so I'll have to enjoy it in your garden. This month, I am only showing flowers in the red and orange spectrum. It's a Fiesta! Happy Bloom Day! That's a LOT of rain! We had a heavier-than-usual amount ourselves this year but that was way back in the winter months. We're dry as a bone now but then that's normal for our Mediterranean climate in coastal Southern California. I wish I could grow many of the flowers you do, like the lilies and the hostas, but I do have zinnias! Thanks for hosting GBBD, Carol! I wish my Zinnias knew it was their time. They're still in bud. I want flowers! Your zinnias look fantastic! They are not widely grown here for some reason. Love the bottle tree. It looks like I am losing a dogwood tree so I may have to create a blue bottle tree. Hmm...how many bottles of wine will that be? It's looking colorful over in your garden! As usual, you are a few weeks ahead of my garden. My Limelight and Little Lime hydrangeas are yet to bloom this year, though they're in bud. My Let's Dance series hydrangeas are sadly lacking again this year. I think I'm going to replace them with the new 'Seaside Serenade' series of mophead hydrangeas that are hardy down to zone 4! Can you believe it? That veronicastrum virginicum is fabulous Carol. It almost looks alive. I have failed when it comes to zinnias yet again :( Perhaps forgetting to sow them didn't help but next year I'm going for direct sowing to see if I can improve on my dismal track record. I wondered who was getting all of our rain. We get the flash flood warnings but the rain fails to fall. Oh well...A gardeners life I suppose. I do know one thing, I need more of those big gorgeous lilies like you have shown. Your blooms all are gorgeous. Happy GBBD. Lovely! Your flowers look great... mine are a bit more sun-baked, but that's what summer is for! Thanks for hosting GBBD! Great stroll Carol. You got tons of summer blooms. Do you have a blooming Voodoo Lily? I do. Ha ha ha, Carol, this is a bottle tree no judgement zone. Happy GBBD! Hi Carol, thanks for hosting your lovely meme! Your garden looks very nice with so many interesting and beautiful plants flowering right now. I especially love the Agastache 'Blue Fortune'. And may I say that I envy you about all the rain that you are getting? This year I have developed a new passion: Dahlias!!! And they are truly showstoppers in the moment. Of course, my beloved roses are blooming, too, but they suffer from the summer heat we are having. Oh well, at least that makes it guilt-free to cut them for indoors... ;-)! Oh my, you've reminded me that I forgot to include zinnias in my Bloom Day post! Oh well, that will give me something to show off in August:) Your garden is looking beautiful, Carol, and I think a green bottle tree is perfect for you. Glad you have gotten so much rain, though maybe more than you wanted. It seems like this year everyone has either too much or too little rain, no happy mediums. I'll just have to garden vicariously through you until the Fall here in Texas! LOOOVE the blooms!! I am impressed with your zinnias! Mine are wilting from the heat and lack of rain. If anyone has a bit too much rain, just send it south to Tennessee. I was going to go outside and take some pictures to post a Part 2 but it's too danged hot. 96 at 7:30, heat index 118. Your garden is looking great! We've had a ton of rain too, so our July is looking better than it does many years. I'm betting rain is also.the cause of all the daylily reblooms I have in the garden right now! Wow, I have or had most of the flowers you are showing in this post. False sunflowers are a winner in my garden, need to find room for more. Used to have Phlox very pretty but they seemed to spread to easily and not last all summer...well that's what I remember anyway. The bed they were in was a bit crowed...bad habit of mine. Thanks for hosting Carol and well done on such beautiful photos, you put mine to shame! Love the tall plants, and LOVE zinnias ... "If you don't have a few zinnias in your summer garden, what's wrong with you?" -- Indeed! Thanks for hosting.